Suitable for working on medium-sized areas with obstacles between the apron, taxiways and runways. 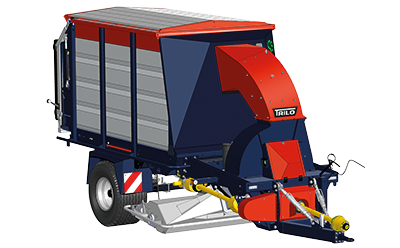 TRILO’s medium-sized vacuum sweepers are compact and manoeuverable machines with a loading volume of 8 – 12 m3 for mowing and collecting grass clippings. FOD present in the grass is simultaneously collected by the suction hood. A powerful fan provides an eneormous suction power and is mounted in a housing fitted with a replaceable lining. The fan is driven by a PTO drive shaft attached to the tractor and requires an output of The required hp PTO can vary depending on the working conditions.90 – 130 HP (66 – 96 kW). Each TRILO vacuum sweeper can optionally be equipped with a wander hose. • Mowing and collecting grass clippings and FOD in one pass. • Reduces food availability for insects, animals and birds. • Reduces risks of bird en wildlife strike. • No FOD that can be ingested by jet engines. • No build-up of thatch and unwanted fertilising by old grass clippings. • Ability to continue working longer due to a larger loading capacity. • Large radial tyres limit rutting and soil damage. • Easy emptying using a chain floor. • Can be operated by one person.